by PaulEMoz in "Bank Panic", "West Bank", "Westbang", "iPhone", "iPod Touch"
I know what you're thinking... the same thing as me. Bit of a rubbish title, that. And yes, it is... but it does serve the purpose of immediately letting a certain section of gamesplayer know exactly what the game is... a copy of Commodore 64 classic, West Bank. Die, fatboy! Watch out, granny! 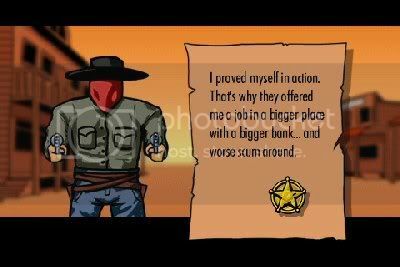 West Bank, of course, is a clone of arcade game Bank Panic, where you are the trusty lawman protecting the bank from varmint robbers and collecting and safeguarding the honest citizens' cash. It's a simple formula and a simple game, and it's pretty addictive if done well. Look at that. Don't mess with me, robber scum. Westbang is done well. 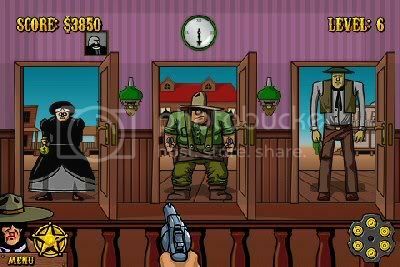 It hasn't messed with the formula much... it's dispensed with the need to scroll left and right (they must have set the game in a time when Wild West towns had smaller banks), and have added kind of a boss duel draw screen, where a boss bad guy stands, flanked by a couple of minions, and you have to dispatch them all when they draw their guns. Bit unfair... one on one might be fair. Oh well, you're all going down! And that's about all there is to it. Chances are you've played and enjoyed a variant of this at some point, and you'll welcome the opportunity to lose large chunks of your day to it again. 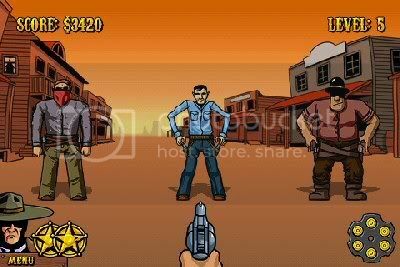 It's colourful, with nice, up-to-date graphics, the controls are perfect for the iPhone just by the nature of the game, and it's a lot of fun. Best of all, it's cheap... or free, in fact, if you grab it quickly. Do it! Westbang (iPhone/iPod Touch) - Free!